Kasich says the budget has important money for community projects. Gov. 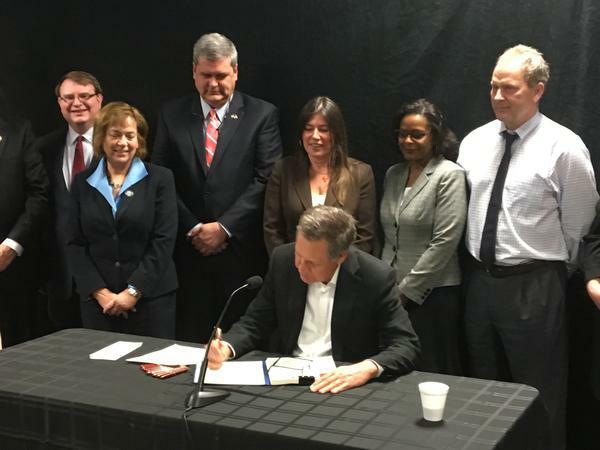 John Kasich has signed a $2.6 billion capital budget, which covers state spending on infrastructure, colleges and universities, and community projects for the coming two years. Ohio Public Radio’s Jo Ingles reports. Kasich says this capital budget provides needed money for roads, bridges, schools and the opioid crisis. He says this budget is fiscally solid and the state is better off than when he took the helm in 2011. Many Democrats dispute that number. Kasich’s first capital budget didn’t include money for community projects. But this one includes $150 million for local projects, along with funding for a state park in southeastern Ohio, improvements to Lake Erie, and a new mental health hospital in Columbus.